We definitely have a winner now. The 2019 NFL prediction mini-league competition has one final round still to go but as this only involves one match – the delayed Division Three decider this weekend between Westmeath and Laois – and. seeing as the points on offer for that game aren’t enough to alter the final placings, it’s safe to conclude that we have a winner. 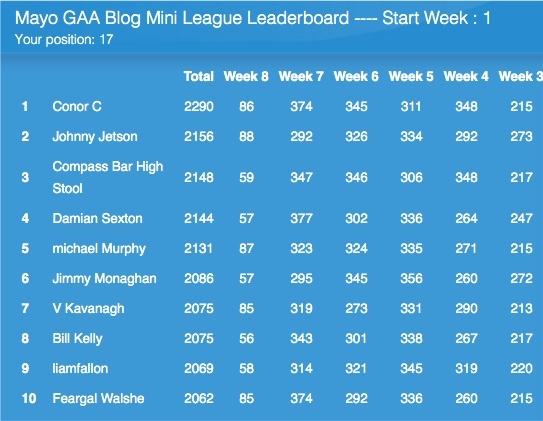 Still out in front after Week 8 and now with an uncatchable lead of 134 points over his nearest challenger, Conor C is set to win this year’s NFL prediction mini-league competition. He’s led all the way, without even a hint of a blip as he went along from one round to the next, and so he’s a very worthy winner. Congrats to him. Here’s the leaderboard after Week 8. For the sake of completeness, I’ll post the final top ten placings after Saturday’s Division Three final has been played. Cusack on Sunday, ya know?